MOSCOW (Reuters) – The Russian central bank, which has spent over $40 billion to bail out three banks in the past year, would like to take control of the assets of the owners of banks it has had or will have to rescue, Governor Elvira Nabiullina said. The central bank took over Otkritie, B&N and Promsvyazbank via bailouts last year, through a specially created fund. So far, it has recovered around 100 billion rubles ($1.6 billion) in assets from their former owners, she said. In an interview with Reuters, Nabiullina said the central bank injected 758.3 billion rubles ($12.2 billion) to boost the capital of the three banks, while another 1.86 trillion rubles ($30 billion) was provided in deposits. She said these figures were likely to be final and the central bank was only considering providing additional liquidity for a yet-to-be-created non-core asset bank, which will take over the non-core and bad assets of the banks that have been bailed out. “If the controlling shareholder has brought the bank to the situation where its license is to be withdrawn or the state is forced to spend funds on a bailout, then the (former) owner should be responsible with all their assets,” she said regarding the compensation for the state bailout of a lender. Nabiullina added that the Russian banking sector is forecast to post a profit of around 1.5 trillion rubles this year. Nabiullina, who became the central bank’s governor in 2013, is gradually cleaning up the Russian banking system, which has already lost around a half of its banks in the last five years. To limit the risks from western sanctions on the Russian economy, the central bank has started wean banks off lending in foreign currencies – mainly in U.S. dollar – especially after the central bank adopted a free-floating ruble regime at the end of 2014. 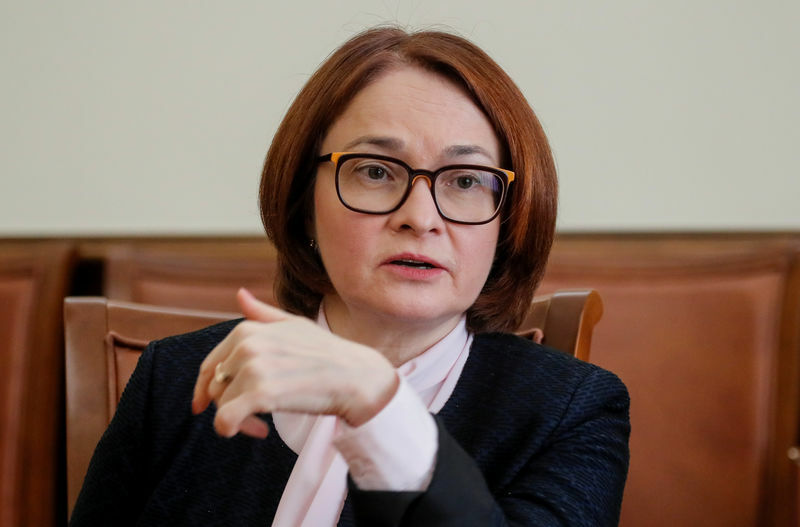 Nabiullina said that the share of forex loans out of all loans had fallen to 21 percent from 31 percent over two years alone and that the central bank is going to tighten requirements on forex lending further. “We are currently preparing proposals… on increasing provisioning requirements for forex loans on all types of borrowers, including exporters. There was no such requirement in the past,” she said. She said the central bank wants to include exporters in order to limit the forex risks the banking system faces from volatile oil prices. Blaming excessive merger and acquisition activity by banks and their former owners as one of the triggers for the bailouts, the central bank earlier this year proposed increasing provisions for loans extended for such deals. German Gref, the head of Russia’s top bank Sberbank, of which the central bank is a controlling shareholder, has strongly opposed the proposal, arguing that M&A deals for banks are a way to sell off bad debts. Nabiullina said the central bank would still like to gradually wean banks off lending for M&A deals as they are too active in this field instead of in lending for investment projects that could boost economic growth. “We are currently discussing how rational it is to introduce increased provisioning requirements for outstanding (M&A) loans. The is no decision yet,” she said.